Standard washer-dependent banjo connectors and couplings, as well as banjo hydraulic, pipe and hose fittings, attempt to create a seal with washers, which is difficult and virtually impossible to reseal reliably. They typically have poor resistance to vibration and require high assembly torque, possibly resulting in stripped threads and tensile failure of bolts. The components require fine surface finishes on port faces and banjo seats, and flow characteristics are obtained through the difficult and expensive process of recessing bodies. Their washers may also fall off and can be difficult to handle during assembly. This design has 4 separate leak paths. In contrast to these traditional designs, every Zero-Leak Gold Banjo fitting assembly has two metal-to-metal seals, plus O-ring back-up seals. The primary metal-to-metal seals are designed to utilize the taper of the SAE J1926 and ISO 6149 port configurations to minimize gaps that occur due to axial movement associated with internal pressurization. Each engagement is several thousandths of an inch and generates high unit loading and maximum gap minimization between mating components during application of assembly torque. These design features combine to produce high-integrity metal-to-metal interfaces. Furthermore, elastomeric seals (O-rings) act as “belt and suspenders” back-up seals for the metal-to-metal seals. There are two O-rings in each ZLG banjo fitting assembly. Both are positioned in machined recesses with cross-sectional areas greater than the cross-sectional areas of the elastomers they contain. Zero-Leak Gold banjo fittings, connectors and couplings offer a number of advantages over competitive products in pipe, hose and hydraulic fitting applications. 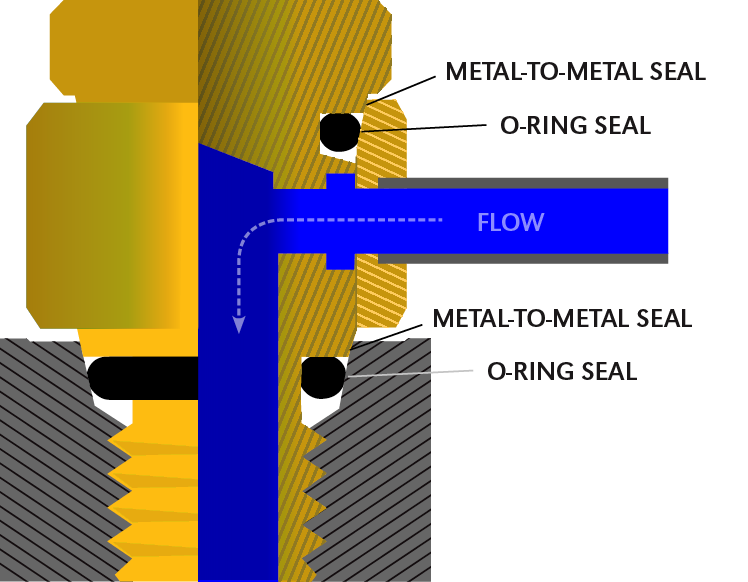 First, separate independent seals provide protection against weeps and leaks, and they can reseal repeatedly while withstanding vibration, temperature variation and pressure spikes. ZLG banjo fittings also offer significant cost reductions in most applications and are available in a wide range of assembled torque values. No washers or chemical sealants are required, and they can be designed for custom ports as well as standard SAE and ISO ports.